I just ran across this archived post on your site. 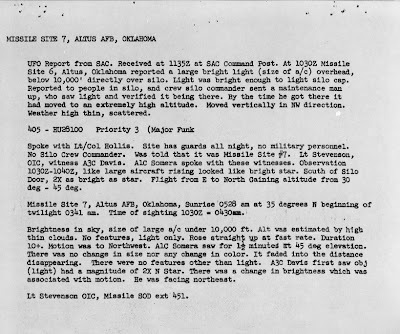 STRATEGIC AIR COMMAND (SAC): UFO Spotted Over Missile Site 7 Altus AFB. I'm a Munitions Specialist and was stationed at Altus AFB roughly from 1982-84. Having worked in that bomb dump this report baffles me. The bomb dump had a couple of igloos (bunkers) that had vaults built in them. I was told, by my supervisor, this is where they kept the nuclear warheads for the nuclear bombs that SAC Alert would use against Russia if need be. So I'm puzzled about the mention of sites and missiles in this article. As far as I know Altus only had a SAC Alert that deployed nuclear bombs not missiles. If you have more info on this I'd really like to know. Strategic Air Command (SAC) activated the 96 Bombardment Wing, Medium, at Altus AFB in November 1953; on June 21, 1954, SAC assumed full control of the base to host bombers and support aircraft. SAC flew B-47s and KC-97s at Altus until 1958 when they were replaced by B-52s and KC-135s. In late 1959, Hound Dog and Quail missiles were installed on B-52s assigned to Altus. SAC also had 12 Atlas missile sites in the area which were inactivated in 1965. Near the end of January 1960, Senator Kerr, Senator Monroney, and Representative Toby Morris made the first public announcement regarding the installation of an Atlas F missile facility at Altus. In April, the Corps of Engineers, Tulsa District awarded the basic construction contract to Morrison-Knudsen and Hardeman and Associates. The two firms had submitted a combined bid of just over $20.9 million. The 12 launcher locations were at or near Lonewolf; Hobart (2); Snyder; Cache; Mantiou; Frederick; Creta; Hollis; Russell; Willow; and Fargo, Texas. To acquire the needed 12,879 acres, in October, the Real Estate Division of the Tulsa District filed condemnation suits against 477 landowners in the 6 counties surrounding Altus. As at other Atlas construction sites, Tulsa District Engineers were befuddled with the concurrency problem where improvements in the missile required constant modifications to the ongoing launcher construction. However, the Tulsa District managed to keep the project on schedule by using a “Red Ball” system that prioritized Atlas paperwork. Problems elsewhere forced the Army to centralize construction management. Therefore in November 1960, the responsibility of construction was transferred to the newly formed Corps of Engineers Ballistic Missile Construction Office (CEBMCO). Consequently, approximately 175 Tulsa District employees found themselves working for the Los Angeles-based organization.